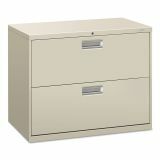 HON 600 Series Two-Drawer Lateral File, Letter/Legal, 36w x 19-1/4d, Light Gray - HON Brigade 600 Series lateral files are engineered for high-activity filing and retrieval in corporations, educational institutions, hospitals, and government offices. The rugged inner steel grid stands up to years of rigorous use. Most models feature standard drawers, and select models have receding doors with roll-out shelves. Heavy-duty ball-bearing suspensions are tested to simulate decades of use and still perform flawlessly. The mechanical interlock inhibits more than one drawer from opening at a time. Counterweights are factory-installed where required to maintain stability when a drawer is opened, and made from recycled material. 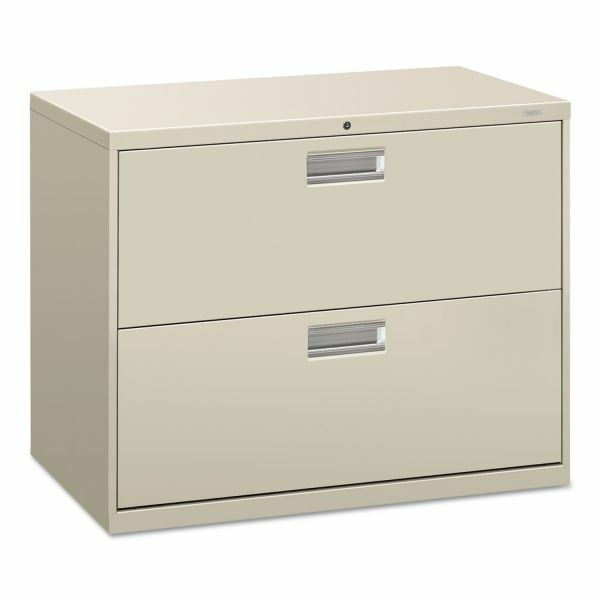 Side-to-side hangrails for letter or legal filing are standard, and optional front-to-back hangrails can be ordered for high-density letter filing on some cabinets. All four leveling glides can be adjusted even when drawers are full. Removable lock cores can be changed on location.